Hello and welcome to 5T! Make sure you take your reading record home every night and get it signed five times a week. There are questions you can answer to comment about your book. Homework is given out on a Friday and must be completed by the following Wednesday. Our P.E. lessons are on a Monday afternoon with Everton in the Community and Wednesday with Mr Fidler, please make sure you bring your P.E. kit in every week. Mr Fidler will teach you computing on a Monday and Mr Rigby Science. We will be learning about Forces in science which includes friction, gravity and air resistance. This term we are getting ready for year 6 and are being taught by year 6 teachers - Mrs Berry and Miss Sheridan. English - we will be doing lots of narrative writing looking at a variety of sentence techniques and using imagery. We will also be covering units on Narrative Poetry, Dramatic Film and Reports. We will be using Spellodrome and Spag on line to support us with our GPS. Remember we can use Spellodrome at home too. Maths - in maths we will be covering place value including negative numbers and written calculations. Using mathsletics will help my maths skills further. Miss Booth our headteacher, teaches us on a Friday afternoon. She is helping us with our Spanish alongside our Spanish teacher Teresa. Miss Booth is also ensuring we know how to join our letters for a better handwriting style and reading a story each week. Our IPC topic this term is Go with the Flow which means we will be looking at rivers. We will learn how rivers are formed, terminology for parts of a river and their vital part they play in our livers. This half term we have been looking at legends. We have enjoyed looking at a variety of legends from all over the world. Stories we’ve read include: Sir Gawain and the Green Knight, Arthur- High King of Britain and the Dragon of Krakow. We are almost ready to write our own Legend. Our following topic is Poetry; we’re all excited to explore our ideas and showing off the creativity in Year 5. Look below to see some of the fantastic newspaper reports that we created from the book 'Tuesday' by David Wesiner. During our Maths lessons this term, we are all exploring the relationship between decimals, fractions and percentages. Particularly when looking at Fractions, our topic has emphasised the need for us to learn our times tables! 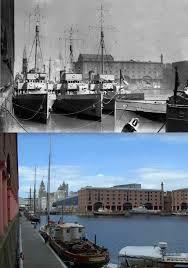 This term we are exploring Liverpool in our new topic Here and Now, There and Then. We will be completing a Local History Study on how Liverpool has changed through tourism. So far we have visited the Liverpool Museum, finding lots of interesting facts. We were also lucky enough to have had a fantastic tour of the city by great guy called Ian, with some seriously bad jokes. We’re all really excited to find out more about the history of our home city! For more information on Liverpool history, look at these websites. Now our Living Things topic has finished we are getting ready to start our new topic on Materials. This week we created a mind map exploring what we already know and what we would like to find out. We’re all excited to find out if some of our predictions are true, especially the one about gases!